Colors: Simulated wicker molded melamine grain top with bronze mist satin finish base. 42" Round x 29"H. 45.60 Lbs. Made of 100% resin base. 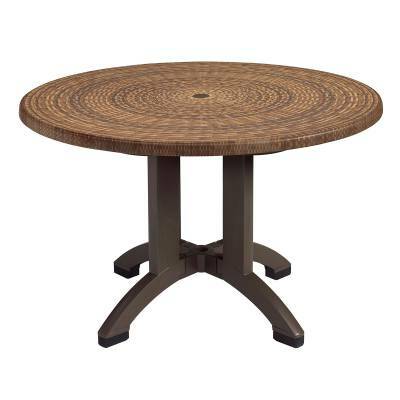 Fine outdoor dining Atlanta 42" Round Table Wicker Decor table in a rich wicker decor. The hard, smooth molded melamine treated seamless construction is made to resist staining, burning, scratching and fading. The Atlanta will retain its original color and beauty without graying. Features a large 4-prong pedestal base is made from prime resin, a composite that is impervious to salt air, chlorine and most common stains. Has an umbrella hole with cap to fit any Grosfillex umbrella with a 1 1/2" pole.